GCA Altium acted as exclusive financial advisor to the shareholders of Finanzen Group, the leading European online marketplace for high value customer leads in the finance and insurance sector (e.g. health and life insurance), on the sale to Eli Global. This transaction underpins GCA Altium's strong expertise and significant transaction experience in the FinTech and InsurTech sectors. Headquartered in Berlin, Germany, Finanzen connects lead generators such as online price comparison websites with lead buyers such as independent financial advisors and insurance companies. Leads are traded in real time and Finanzen therefore bridges the gap between consumers who search online and the offline sales organizations of insurances and brokers. In addition, the company acts as an online broker for certain insurance products. Finanzen has shown significant growth over the past four years, more than quadrupling its revenues and building a truly European platform. Dirk Proessel, Finanzen’s CEO, said: "We are pleased to have found such an experienced and suitable partner in Eli Global. Their strong global footprint can support the ongoing growth of our business model and our ambitious national and international goals." Tobias Schultheiss, Managing Director at GCA Altium, added: "Thanks to its scalable business model, Finanzen is ideally positioned to benefit from industry trends and to capture the significant market potential ahead. We are convinced that the company will continue to flourish under Eli Global’s ownership." Eli Global is a federation of independent portfolios comprising more than 100 businesses which generate revenues of more than USD 1 billion and employ more than 7,500 employees in 18 countries around the world. Eli Global’s companies operate in 15 different sectors, including healthcare, technology, insurance and financial services. BlackFin Capital Partners manages two financial services growth / buyout funds with aggregate commitments in excess of EUR 600 million. Run by its four founding partners, the team altogether consists of 25 experienced professionals operating out of offices in Paris, Brussels and Frankfurt. BlackFin’s investment strategy focuses on asset-light businesses in the financial services & technology sector, across continental Europe. 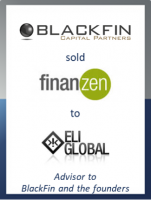 GCA Altium acted as financial advisor to BlackFin and the founders of Finanzen. The transaction was signed in February 2018. Terms of the transaction were not disclosed.